Fife Flyers have filled the key number one slot in their line-up with the signing of Canadian goaltender Shane Owen. The 26-year-old left-hand catcher has made almost 150 appearances in the ECHL and also earned a call up to the AHL in 2011. Owen, from Shanty Bay, Ontario spent last season with Indy Fuel and Elmira Jackets, where he ended the season with an impressive .926 save percentage and a goals against average of 2.30. The 6ft 1in stopper will be looking to build on this form in Fife when the new Elite League season gets underway in a few weeks time. “When this opportunity came up, I knew I had to make a decision fast,” Owen explained. “I had a few offers on the table, but after speaking with the Flyers, and listening to what Todd had to say regarding where the team was at and where they want to go, I knew Fife was the right choice for me. “I want to help them win silverware and I’ve heard that Fife Ice Arena is a lively building on home game night, so I am looking forward to hearing the fans on opening night, and every game night for that matter. 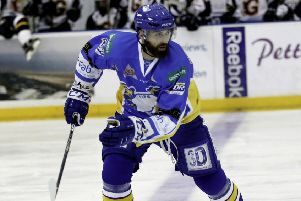 Head coach Todd Dutiaume added: “Shane will fit in very well in Fife, and will be well liked by all of his team mates and the fans. “He has a drive to be the best at what he does and has made it clear that he comes to us with the intention of winning. “He will challenge our guys to be better and will help us win hockey games. Owen played alongside another recent recruit, Sebastien Thinel, at Missouri Mavericks in season 2013-14.